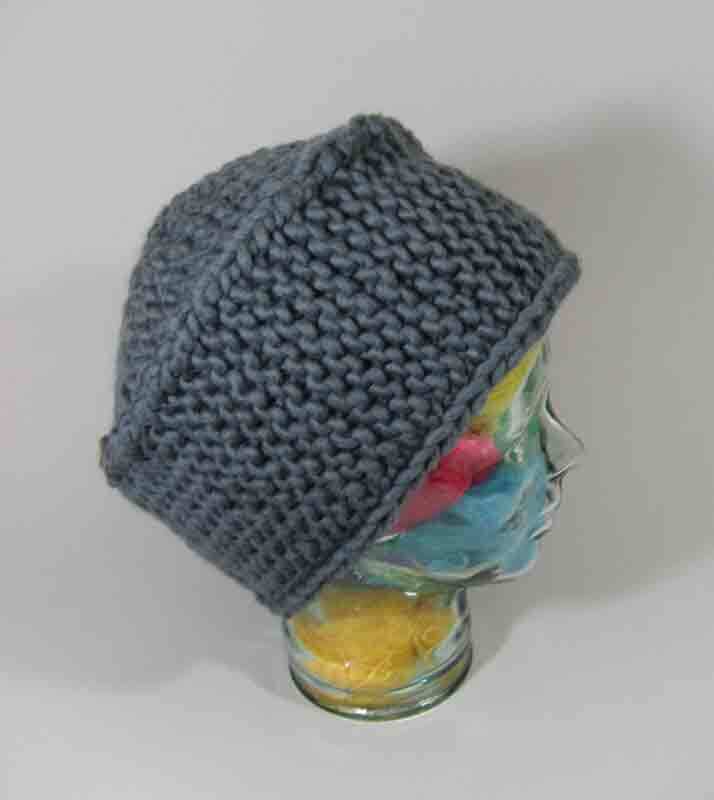 This is Elizabeth Zimmermann’s Pillbox Hat. Not exactly Jackie Kennedy stuff, but sort of “…in the style of.” The pattern is included in Schoolhouse Press’s “Knit One, Knit All,” a posthumously published book of EZ’s garter stitch designs. Pillbox is supposed to be knit in Super Bulky Sheepsdown at 3 stitches to the inch. Classic Elite’s now discontinued Waterspun Weekend should have been a good substitute. Well, I am a major pumpkin head and even my head was too small for this hat. Glass Head could have been wearing three hats under her Pillbox and had a mess of raccoons in there too when this photo was taken and you’d not have known it. I finished knitting this hat about three years ago. No head has yet appeared to claim it. I was felting some slippers in the washing machine last week when it dawned on me that felting Pillbox could yield something interesting. But I wasn’t sure what. 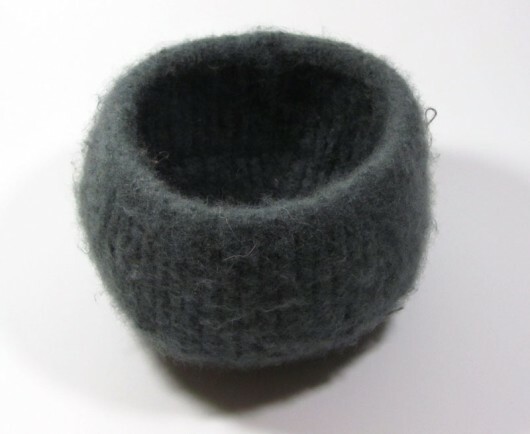 Check out my new felted bowl. I’m quite tickled with it actually. I haven’t figured out exactly what I’ll keep in it. If you have suggestions I’d love to hear them. This is a lesson in what a difference a half-stitch in gauge makes. It is supposed to be three stitches to the inch, not 2.5. But I’ve had two skeins of Classic Elite’s Weekend Waterspun in my stash for years and this hat looked to be the pattern that yarn was waiting for. Plus I basically have a pumpkin for a head and I come from a family with other pumpkin heads. I do like loose hats, but this one is probably pushing it. I may felt it and, if I do, I’ll circle back around and post the results. 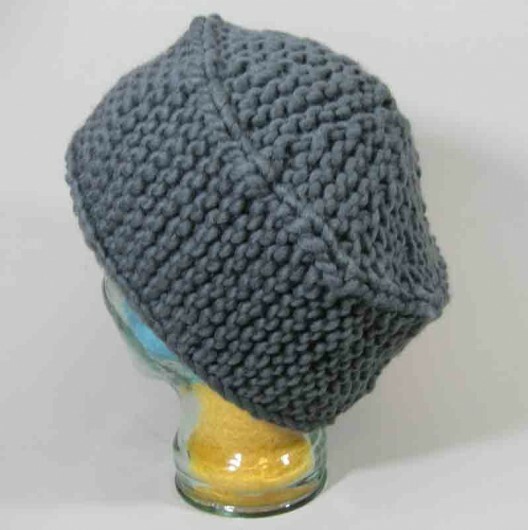 This is Pillbox Hat from Knit One, Knit All, Schoolhouse Press’s new book of Elizabeth Zimmermann’s Garter Stitch Designs. The book is a real charmer. Filled with original comments by EZ, copies of her notes on the patterns, including more of her water color paintings. Garter stitch star booties, clever shaped hats, mittens that fit on either hand, gloves worked flat, and beautiful sweaters and vests. As always with EZ, and garter stitch, the look has a homely quality to it–meant in a good way as conjuring up all things cozy. The projects are starting to sprout on Ravelry and the Zimmermaniacs are knitting up a storm. Jared Flood has a wonderful blog entry on the book, complete with photos of two never-photographed-before hats that EZ knitted for a neighbor, Joan Morhard Smith (who knew the guru of modern knitting as “Betty”). I bet Betty would be pleased that her daughter (Meg Swanson) was able to publish the garter stitch book EZ’s publishers thought would not sell. They are going to be proven wrong.